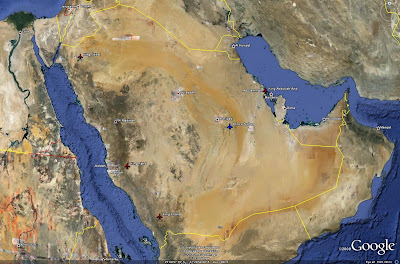 The Kingdom of Saudi Arabia contains what is arguably some of the most valuable real estate on the face of the planet. The massive oil reserves have turned Saudi Arabia into an economic powerhouse in the late 20th Century. It should come as no suprise that a portion of the Kingdom's profits were spent on military systems to defend the Kingdom from regional aggressors. 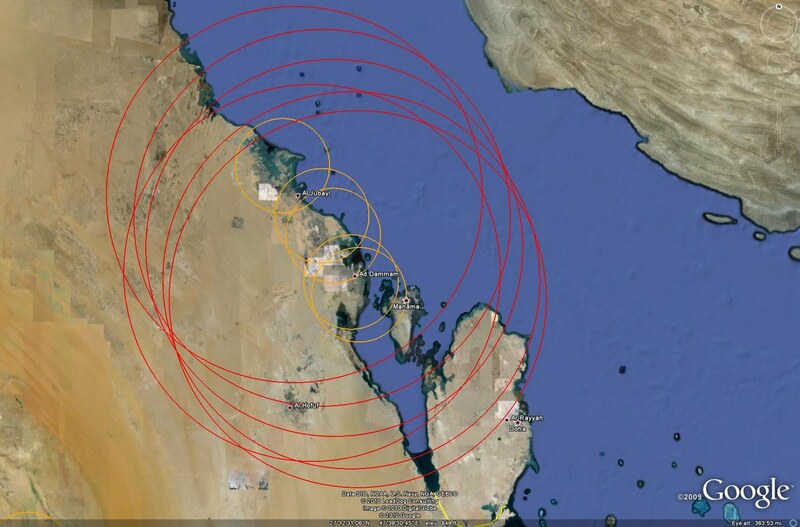 Encompassing a vast amount of relatively barren territory pockmarked by population centers primarily situated along the coastlines, Saudi Arabia employs a point-defense oriented SAM network. The bulk of Saudi Arabia's defensive assets have come from the United States and the United Kingdom via a series of multi-billion dollar weapons contracts. Air defense assets are controlled by the Royal Saudi Air Defense forces. This service branch was separated from the Saudi Army in 1981, and is headquartered in the capital of Riyadh. The air defense forces operate the EW facilities and strategic SAM systems. 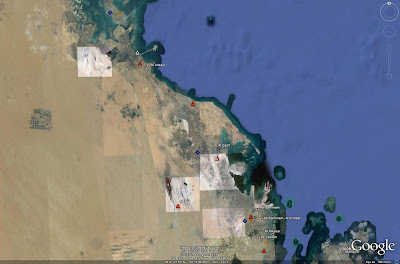 Twenty nine EW sites have been identified in Saudi Arabia, four of which were inactive in the most recently available imagery. The primary EW radars are the AN-TPS-43, AN-TPS-63, and AN/TPS-77, most of which were delivered in the 1980s. EW sites are situated along the border of the nation, with multiple sites providing additional coverage of the nation's interior. The only area devoid of significant EW coverage is the barren southeastern region, bordering the UAE and Oman. The MIM-104 PAC-2 Patriot represents the most capable strategic SAM system operated by Saudi Arabia. Saudi Arabia initially ordered the Patriot system in 1990, and to date has received a total of twenty one batteries. Saudi Arabia has expressed interest in acquiring the ATBM-optimized PAC-3 ERINT system, but a contract has yet to be signed. Saudi Arabia currently fields eleven operational Patriot batteries. 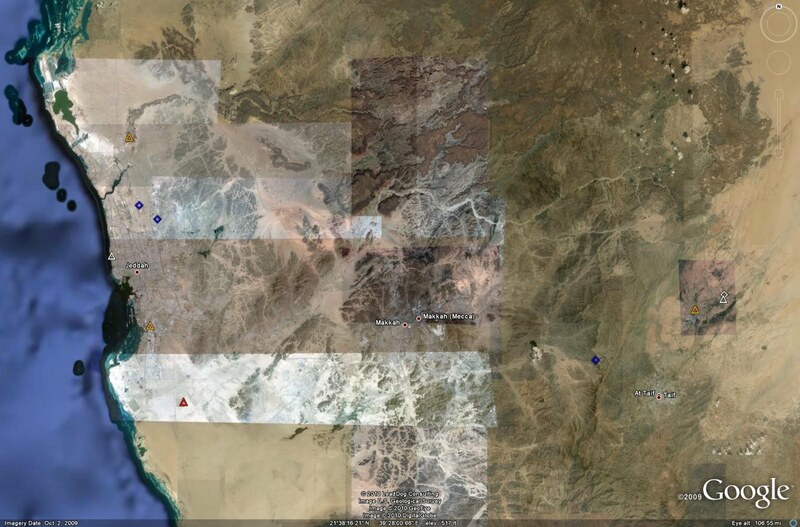 A total of fifteen Patriot deployment sites have been identified, with four remaining unoccupied in the latest imagery. The majority of Saudi Arabian Patriot batteries are deplyed at prepared, hardened facilities. These facilities feature hardened revetments for the TELs and a raised berm for the AN/MPQ-53 engagement radar. 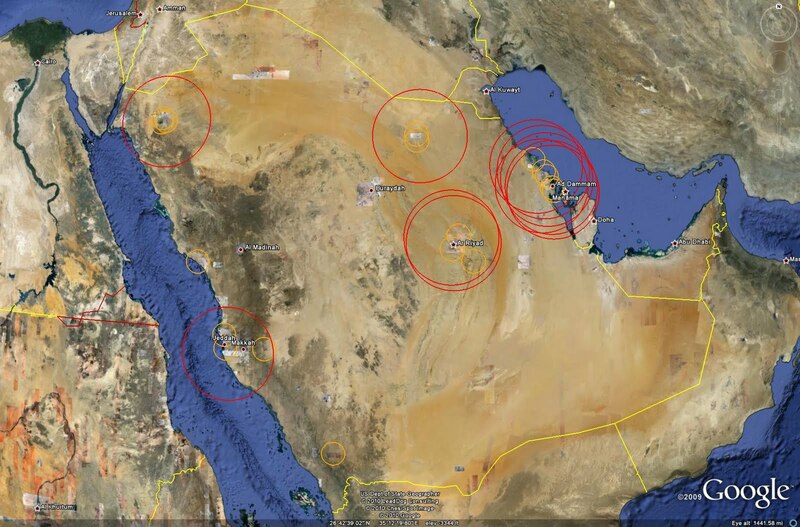 The locations and coverage zones of Saudi Arabian Patriot batteries can be seen in the image below. Note that the bulk of the systems are consolidated along the northeastern coastline, defending the major oil export facilities and the Dhahran metro area. HAWK missile systems have served in Saudi Arabia since the 1960s. Between the late 1970s and early 1980s, Saudi Arabia received the improved I-HAWK system and re-built ten HAWK batteries to the same standard. There are currently eighteen active HAWK batteries in Saudi Arabia, with a further six inactive HAWK sites. HAWK batteries are typically deployed to provide close-in air defense for Patriot batteries. Arrayed in a point-defense layout, the Saudi Arabian strategic SAM network represents a formidable obstacle to any potential aggressor. The Kingdom has deployed strategic SAM systems in a manner designed to defend the most critical locations in the nation. Unsuprisingly, a large concentration of SAM systems are positioned in the northeastern portion of the nation, along the coastline facing Iran. There are five primary SAM concentrations, with each location defended by no fewer than three active batteries. These locations are the capital of Riyadh, the metropilotan areas surrounding Dhahran and Mecca, and the military facilities at King Faisal AB and King Khalid Military Complex. HAWK batteries also protect other locations, such as King Khalid AB. The following image depicts the deployment of air defense assets near the capital of Riyadh. 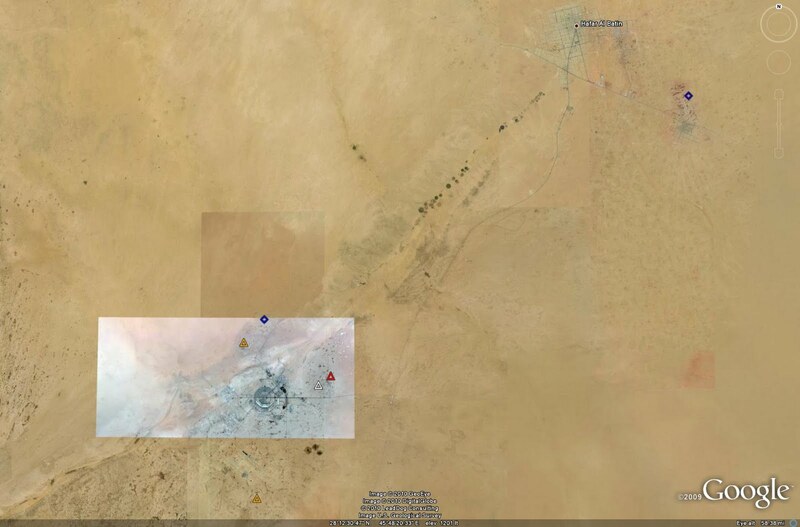 Note the positioning of an active HAWK battery and an EW facility near the military complex southeast of Riyadh at Al Kharj. The following image depicts the deployment of air defense assets near the city of Mecca. SAM assets are deployed along the western coastline to provide clearer fields of view for associated radar systems. 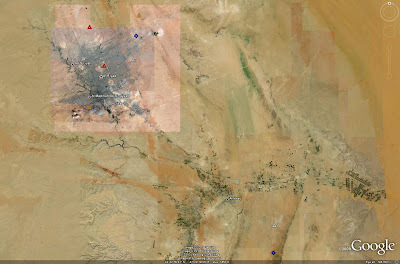 While the HAWK batteries near the coastline cannot defend the skies directly over Mecca, the Patriot battery can range over both areas, including King Fahd AB to the east, which is also defended by a HAWK battery. Given Dhahran's economic importance to the Kingdom, it is defended by the highest concentration of strategic SAM assets found in the nation. 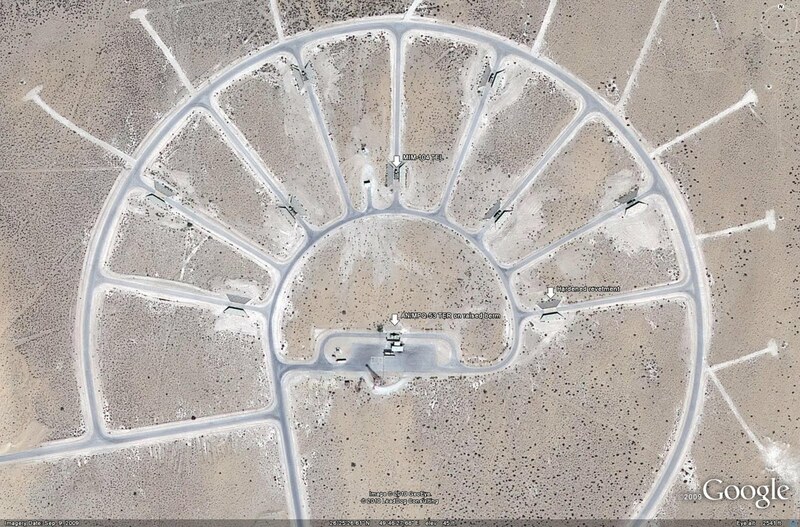 These SAM batteries, currently consisting of six active Patriot and four active HAWK batteries, are arrayed to provide overlapping fields of fire throughout the area. The multiple target engagement capability of the Patriot system makes this the best-defended piece of real estate in the entire nation. The following images depict the deployment of air defense assets near King Faisal AB and King Khalid Military Complex, respectively. Each location is defended by multiple SAM batteries. With a high percentage of Saudi Arabia remaining sparsely populated, the Kingdom also relies on the Royal Saudi Air Force to defend its skies in conjunction with the deployed strategic SAM assets. Current air defense aircraft include the F-15C and EF-2000, with the multi-role F-15S also fully capable of performing the task if required. Air defense capable aircraft are currently deployed at four locations. A fifth location, Prince Sultan AB near Riyadh, is home to the RSAF's E-3 AWACS fleet. These aircraft can serve as gap fillers in the air defense network's EW system, or can direct air defense aircraft to targets. In the same fashion, the air defense aircraft can serve to defend the Saudi skies unprotected by SAM systems. The following image depicts the locations where air defense aircraft are based. Red icons indicate the presence of combat aircraft, while the blue icon represents the Saudi E-3 base. Combining strategic SAM systems and a capable air force ensures that Saudi Arabia is relatively well defended. However, there are certain limitations to the network. Reliance on the aging HAWK SAM system reduces the effectiveness of the network in certain areas, particularly those with the HAWK as the primary defensive system. A potential aggressor such as Iran, with acess to the HAWK in its own inventory, would be well-versed in the capabilities, limitations, and effective counters to the system. Furthermore, the point-defense layout of the network leaves large portions of the nation undefended by strategic SAM assets. While aircraft can be called upon to defend these areas if required, the presence of large gaps in the nationwide air defense picture leaves numerous vulnerabilities open to exploitation by a foreign aggressor. All things considered, the Saudi Arabian strategic SAM network is logically arrayed to defend key religious, industrial and military locations. With the potential acquisition of the PAC-3, the network will enhance its ability to intercept inbound tactical ballistic missiles, possibly forcing an aggressor to rely on airpower rather than missile strikes alone to engage targets. Considering the strength of the SAM network around likely targets, and the presence of the capable RSAF, this could turn out to be a losing proposition for all but the most capable air arms. Don't forget the Saudis also have the Tornado ADV, a rather capable interceptor. The ADVs have been out of service since 2007. 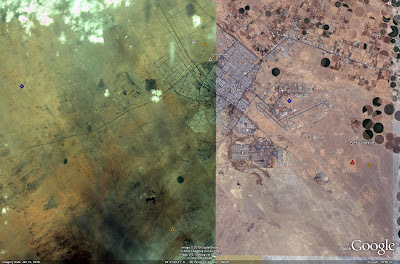 I have a question, is it possible in Google Earth to turn on Airports. I always have to zoom in so much to spot one. Also any way to spot military ones? Any plans to create a file with military airports,depots, military bases like you do for SAMs? Thanks for that article. It really sums up, how the Saudis would need to depend on the RSAF for 'defense in depth'. I visit Dhahran frequently and their Tornado numbers are quite large - probably 10 - 20% of the flights overhead.